My in-laws are visiting. One thing that’s great about visitors is getting to do the tourist stuff you never make time for living in an area. What’s even better about living in a small town like Fredericksburg is the wide variety of of activities without having to travel distances to get to get there. When we lived in the San Francisco Bay Area, and since I was a native Bay Arean, it was difficult to decide on what to do. San Francisco, Santa Cruz, Monterey, Napa were all within driving distance, but most of the time you couldn’t to it all. There was too much! We don’t have that problem in Fredericksburg. Sam’s sister and parents drove down from Oklahoma. We’ve been having a great time time together. Since they’re still here as of this writing, this blog post will be very short. The National Museum of the Pacific War is the premier national museum of the Pacific Theater during World War II. It is a massive, incredible museum that sets the historical, global context that precipitated the war. Admiral Chester Nimitz, a native of Fredericksburg, Texas, was the supreme commander of the Pacific Theater and this museum honors all who served under him in the Pacific. It’s a phenomenal tribute to those who served. My father-in-law was too young for WWII, but after high school enlisted in the U.S. Navy. It was during the 1950s. He was on the USS Bennington, which was active in WWII. It received many commendations for various battles during the war and a plaque honoring the ship and its crew is in the Memorial Garden at the museum. 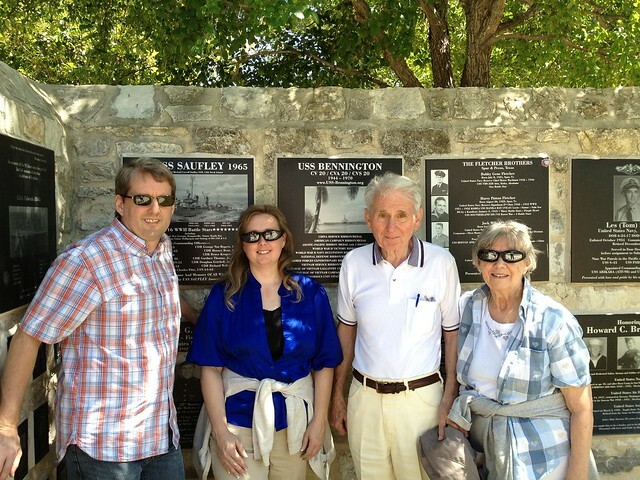 This picture of the family was taken by the USS Bennington plaque. I think we’ll take a ride out the the LBJ Texas White House today. It’s a beautiful day and will be especially beautiful out at the ranch. The last of the wildflowers, First Lady Lady Bird Johnson was so famous for should still be visible. I think they’re enjoying the relative lushness of central Texas! The Panhandle of Oklahoma is flat, brown, and barren! Oh, except for the tumbleweeds!